Dark Ages Romance: Discover the romance of Dark Ages Britain: What inspired my Kingdom of the East Angles series? What inspired my Kingdom of the East Angles series? Sutton Hoo ... a window into Dark Ages Britain. Check out this replica of the Sutton Hoo helmet. The real one is at the British Museum, London. The Anglo-Saxons buried their once rich and powerful dead, with treasures for the after-life. Sometimes the burial included a warrior’s horse, or even a ship. A wonderful example of this is at Sutton Hoo, Suffolk. There are 18 burial mounds, with barrows for Anglo-Saxon East Anglian royalty. The most famous of all, is the barrow for King Raedwald of East Anglia, who was buried in 625 with a huge hoard of riches, including his ship and this magnificent helmet. 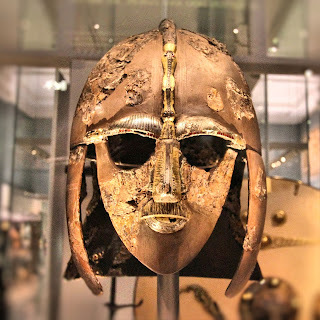 After visiting Sutton Hoo (which is located near Woodbridge, Suffolk, where my mother's family still live), I decided to write a novel set in 7th Century Anglo-Saxon England. My Dark Ages Historical Romance, Dark Under the Cover of Night (currently free on Amazon, Kobo, iBooks and Barnes and Noble) is set around the last year of the life of King Raedwald. It's a love story, but I did a lot of research to make sure the story's historical background 'feels' authentic. East Anglia was extremely powerful during early 7th Century Anglo-Saxon England. Recently archaeologists discovered the remains of an Anglo-Saxon settlement in Suffolk during the development of a wind-farm. Watch a BCC video about the find.